To some of us, the gym feels a lot like torture. But imagine how the gym rats of 100 years ago felt with their crazy exercise contraptions, lack of modern workout gear, and total absence of iPods. 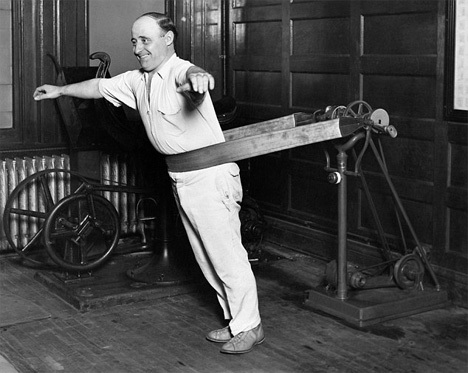 The machine pictured above is a vibrating fat belt, similar to one used by President Calvin Coolidge to shake his fat away while relieving stiff joints. Before treadmills were the high-tech, TV-equipped machines of today, they had wooden slats that rotated around two rolling drums. 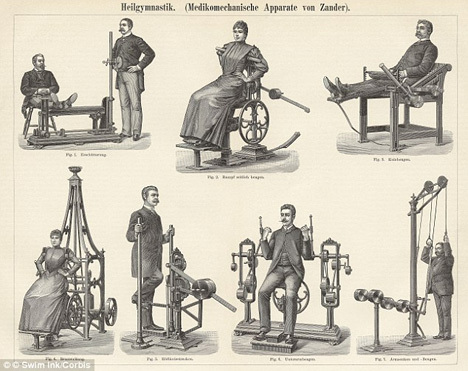 Because this was well before the invention of Spandex and Nikes, people tended to work out in odd cotton outfits and their regular hard-soled shoes. 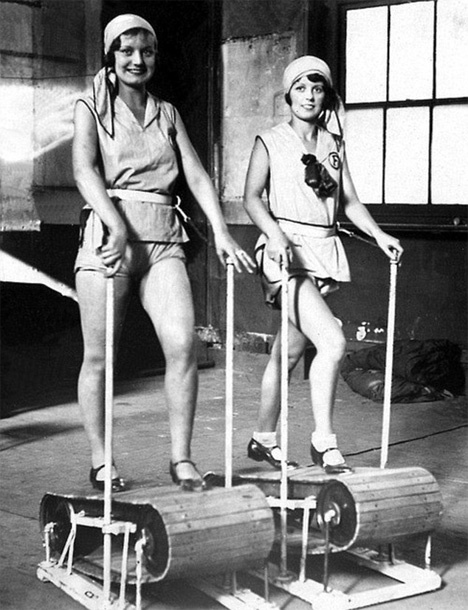 By the 1930s, the treadmill had evolved a bit to include a more comfortable hand rest and a fabric, rather than wooden, walking belt. This model seems to be in a swimsuit and high heels, which we’re glad have gone out of fashion for gym bunnies. 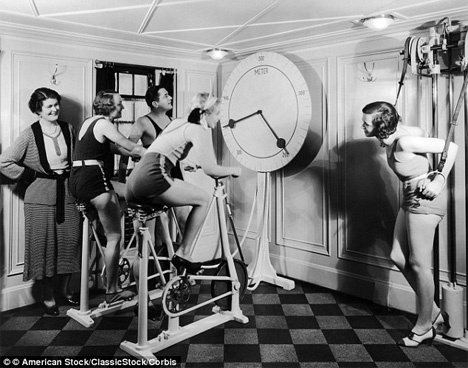 Crazy exercise machines were to the early 20th century what crazy fad diets are to modern folks. 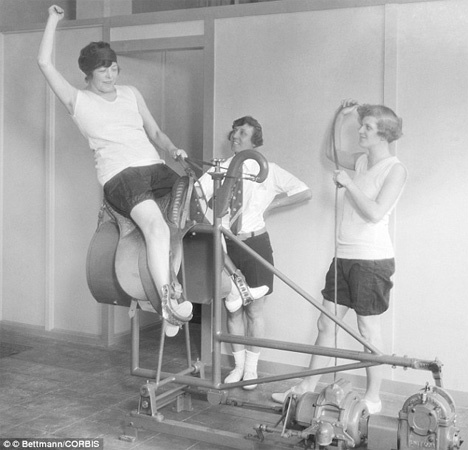 Above, a group of ladies try out a bucking bronco machine. 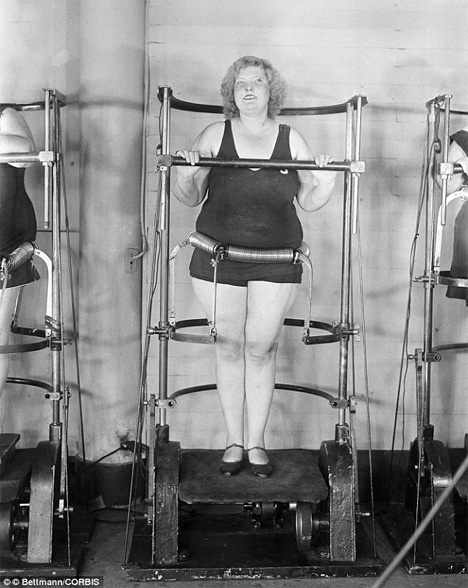 Below that, a woman tries out a revolutionary (for the 1930s) fat-burning machine that vibrated to wiggle away the excess pounds. These early exercise bikes were equipped with a huge dial that told spectators how much energy was being generated by the riders. The footwear still seems more than a little uncomfortable for working out. Although the outfits and specifics of the machines are different today, the general functionality of some of these vintage gym devices are familiar. Bicep curls, leg lifts, lat pulldowns and situps have always been popular exercises; it’s just that today our gym equipment looks a lot less like torture devices. See more in Antique Gadgets or under Vintage & Retro. June, 2013.